And when this super loaded lassi is there in your hand to chill what more could you want to welcome summers. Summertime means time for refreshing and cool drinks. We all love to sip on something cool throughout the day. Lassi, or buttermilk is a very desi antidote for scorching heat. It keeps your body cool and energized. Me and my family prefer this homemade chilled drink over any aerated drink or packed juices. 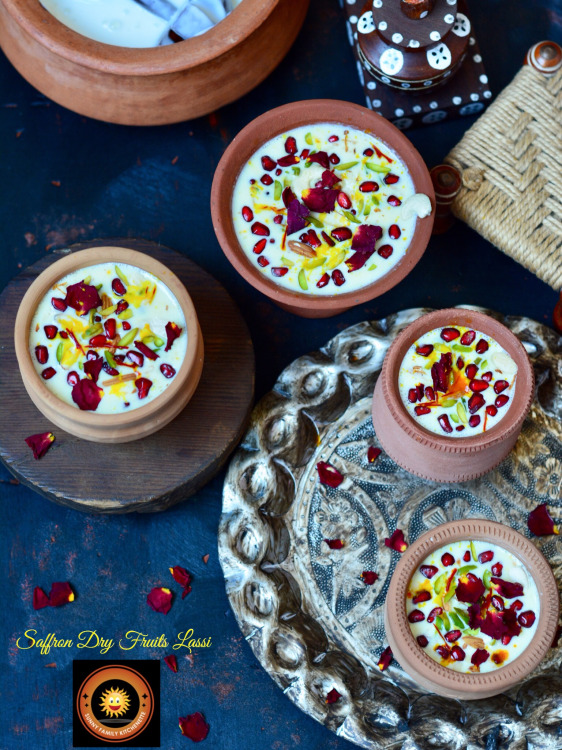 Lassi is a popular traditional curd or yogurt based drink. Lassi is basically a blend of yogurt, water, basic spices and sometimes fruit. Lassi can be made either sweet or salty. Lassi can be made in various flavors too. The salty version is prepared by blending yogurt with water and salt, which is sometimes flavoured with ground and roasted cumin seeds. 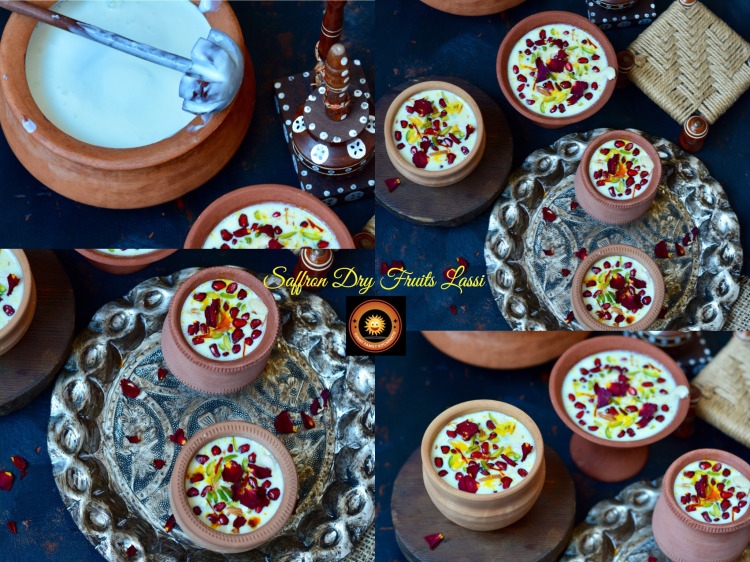 Sweet lassi is a form of lassi flavoured with sugar, rose water or some fruit. 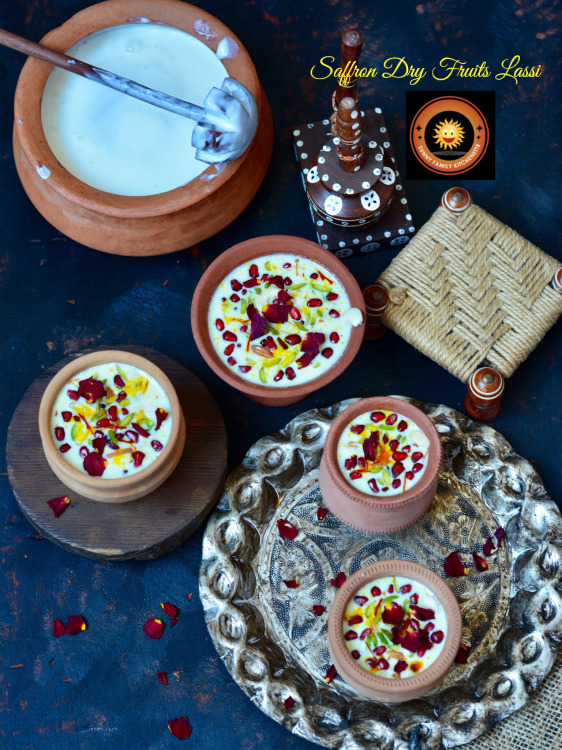 To make basic lassi you have to first blend water with curd/ yogurt. The amount of water added depends on the thickness of the yogurt. The resulting blended water+Yoghurt mix should be lump free and bit towards denser side, similar to what a Pancake or dosa batter’s consistency is. You can blend it either with stick blender or in your mixer. However, traditionally this is blended with a special desi whisk known as Madhani. Madhani is generally made of wood and is commonly found in almost every Indian household. In olden days when mixers and blenders were not there, madhani was used to churn or blend instead. I have churned my yogurt with madhani to bring in that fun element. In fact, my son was super surprised and excited to see this simple tool. 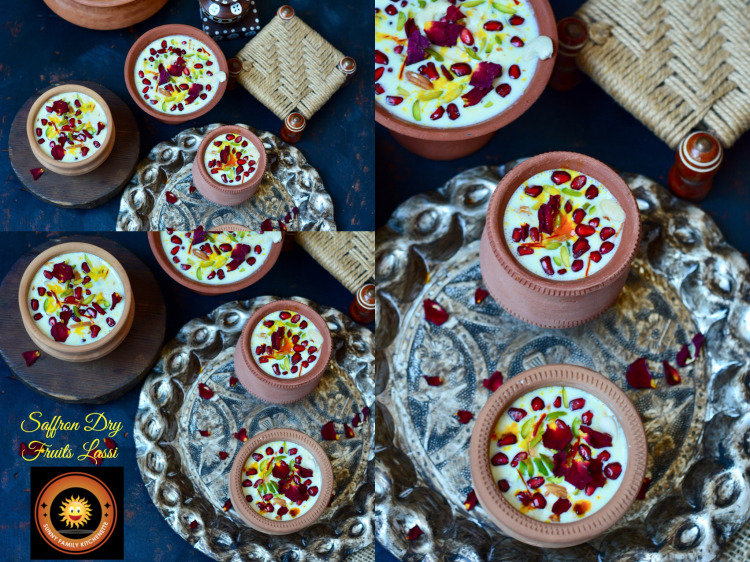 To bring in that authentic desi feel I have served it in earthen glasses or kullhads. This share of mine is sweet. You can say it’s a kind of dessert. So instead of eating your dessert you can sip on to it. 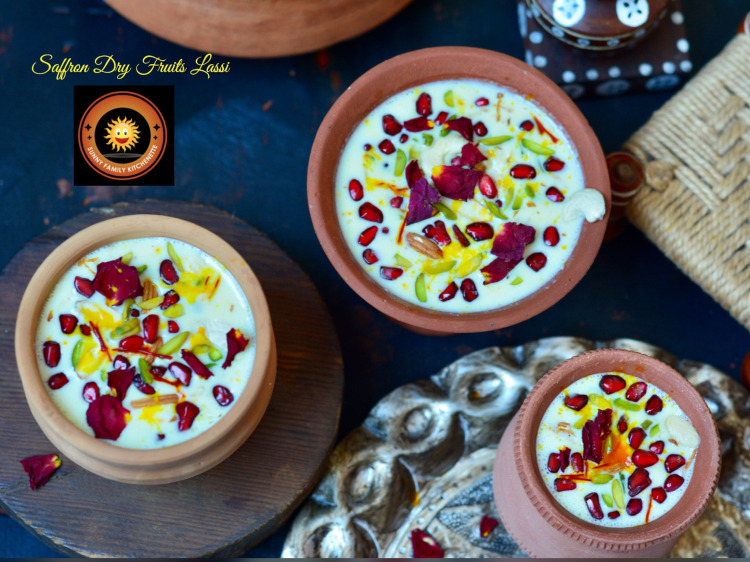 Loaded with flavors and of course dry fruits/ nuts, this lassi is not only very refreshing but will leave you very satiated too. We skipped our dinner and instead gorged on these lassi glasses. 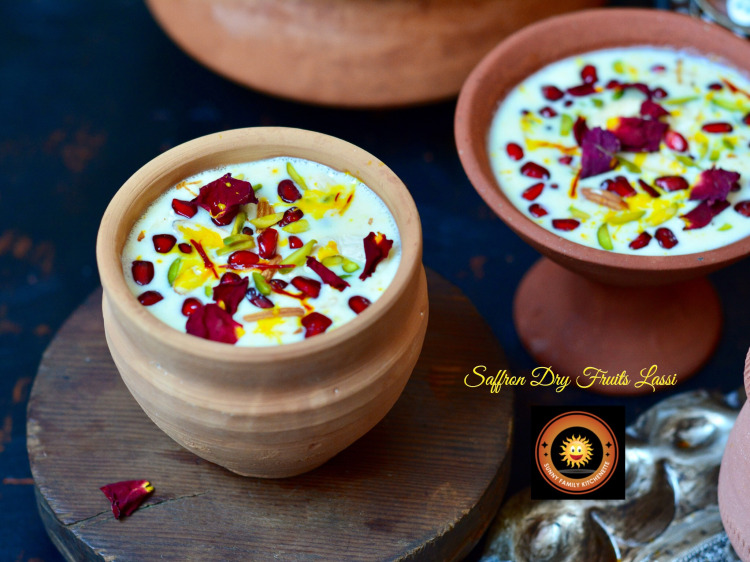 We will start making this flavorful Lassi by first soaking the Saffron in warm water. Let it soak for 15-20 minutes to release it’s flavor and color. Chop cashews, almonds and pistachios. In a mixer or with the help of stick blender, blend everything (listed under ingredients) well. Enjoy the yummy cool treat to beat the heat!! And the theme is 'Lassi Masti'.